When you roll over a section in the horizontal menu, a sub-menu appears with some featured items. 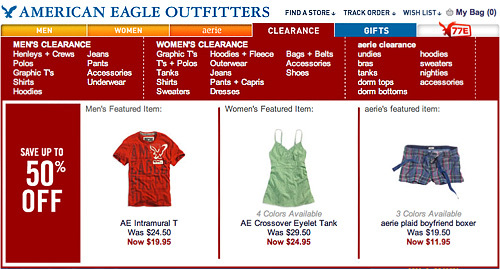 In the example above, you see one featured Clearance item from each category: men’s, women’s and aerie. This technique allows you to show more content without a click. Clicking away from a page means another click if you want to go back. But flyouts give the user a faster peek at what’s behind the menu buttons. And if you accidentally roll over a menu item, you may be enticed by that 50% off offer you otherwise would not be aware of. The downsides of AJAX-y menus are they cover up content, can be finicky and require steady mouse control to operate properly. Or worse, they can appear when you don’t expect them too when you mouse a bit too close to the hot-spot. Not everyone will find this a usability improvement. I noticed when you click on the Clearance button you get different featured items. I think it would be better to keep the same items as in the flyout, because a customer may click out of habit, and wonder where that green camisole disappeared to. You want to minimize the “whoa, what happened?” factor, especially when you’re introducing Web 2.0 coolness that may involve a learning curve. 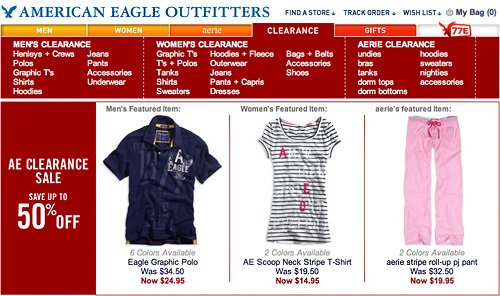 (Even for technosavvy Millennials like the AE customer. It just might be mom or grandma picking out a gift). 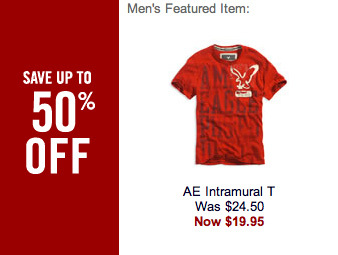 Text in the red box doesn’t need to change after you click on Clearance. If a customer clicks on Clearance, he/she understands it’s the clearance section, you don’t have to restate the obvious. When it comes to online copy – less is more. All-in-all, it’s a pretty neat idea. What do you think about merchandising within navigation? Love it? Hate it? PS: If you’re interested in merchandising tips and trends, be sure to sign up today for our upcoming webinar: Effective Online Merchandising: What Sells? Next articleSearch Within A Search – Good Idea?